the many creatures dwelling outside my back door. The scuttling crabs, trilling birds and croaking frogs provide a backdrop to the bobcats and deer passing through. Often we hear the animals, but do not see them, which may be why my drawings are so fanciful. I imagine their personalities and see their vibrant colors and striking shapes. Their quirky beauty makes me smile and hopefully you will, too. As a daughter and granddaughter of artists, I grew up surrounded by creative souls. After a career in real estate investments, I started down a new path, studying art history and art at Cleveland State University. Then I earned a masters degree in Art History and Museum Studies from Case Western Reserve University in Cleveland, Ohio. I have studied painting and drawing with various artists in Northeast Ohio and Charleston. 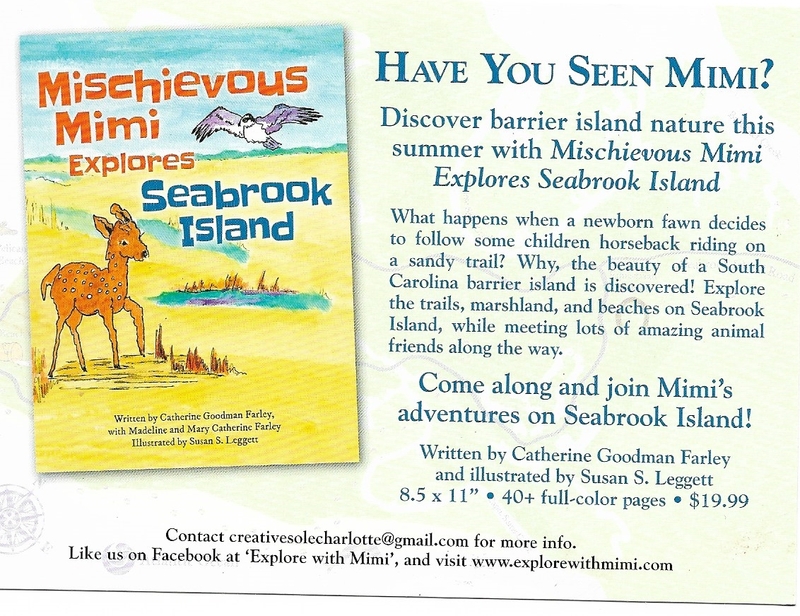 The natural environments of the barrier islands of South Carolina provide the setting for two children's books that I have illustrated, Mischievous Mimi Explores Seabrook Island and Mimi Discovers Sullivan's Island. Both books are available in local bookstores as well as on-line at www.explorewithmimi.com. A third book set on Kiawah Island will soon follow. My work is regularly displayed at the Seabrook Island Lakehouse. I am a member of the Seabrook Island Artist Guild and the Charleston Artist Guild.